A new natural gas pipeline, the Trans-Pecos Pipeline, is being built across Far West Texas. This pipeline will deliver much-needed natural gas to the community of Presidio, TX (they’ve long used propane and other less clean-burning fuels), and will continue as a transnational pipeline into the United Mexican States. Many landowners are worried about landscape damages after construction has finished. Although the pipeline cannot be ignored (the world runs on gas and petroleum for the foreseeable future), the best way to mitigate post-construction damages is to NOT plant exotic grasses like Lehmann’s Lovegrass, Weeping Lovegrass or Buffelgrass. The seed for those invasive species may be cheap, but cheap seed always creates multiple problems decades after re-seeding; not the least of which are damages to wildlife habitat and native plant communities, and further spread and permanent establishment of invasive species. High quality, certified native seed may cost more per pound than exotic species, but those comparisons are moot, and the resulting plantings created by certified native seed will be better and management problems will be significantly less daunting down the road. The commercial seed market in Texas has undergone major changes over the past decade, and currently offers plenty of native seed options (with more in the future) for landowners in Far West Texas to utilize to protect their land and wildlife habitat during re-seeding activities. Before purchasing seed, it is helpful to beware of native seed sources that are listed as”Native” or “Native ecotype” or “Local ecotype” (as part of the varietal designation), or even promoted as “wild harvests” that are not source-identified per state agriculture regulations. These sources of seed pose cleanliness concerns (weed seed contamination), as well as unproven plant performance and unproven restoration uses. Additionally, “Native” and “Local ecotype” are not legally recognized varieties. In fact, many native seed cultivars (i.e. ‘Haskell’ Sideoats Grama, ‘Lovington’ Blue Grama, ‘Kaw’ Big Bluestem, etc.) are bought and repackaged by some seed dealers and commonly sold as part of native “wild harvests”. While such a practice is deceptive, it goes to show how much more reliable commercial cultivars are. After the photo set below, is a list of what should be planted in Far West Texas. These recommendations are based on seed varieties which have been tested for use by the South Texas Natives and Texas Native Seeds Projects at multiple sites across Texas in common garden studies. These germplasms are currently the best options on the market for landowners to use. There are no substitutes (except as noted). Be firm about what you want and don’t want to plant — it’s your land! The following photos illustrate important points with regards to native plant seeds. Above: A pipeline right-of-way re-seeded with two different seed mixes: An appropriate certified native seed mix (from South Texas Natives) on the left; an inappropriate seed mix on the right. Note the greater plant coverage on the left with the use of named varieties of certified native seed. The use of inappropriate seed mixes, wastes seed, money and time, and only serves as encouragement for exotic species infiltration and establishment due to weak perennial gaps in the planting. Above: A comparison of two Blue Grama populations in a common garden study in Far West Texas. “VNS” (variety not specified) on the left, “Hachita” Blue Grama on the right. 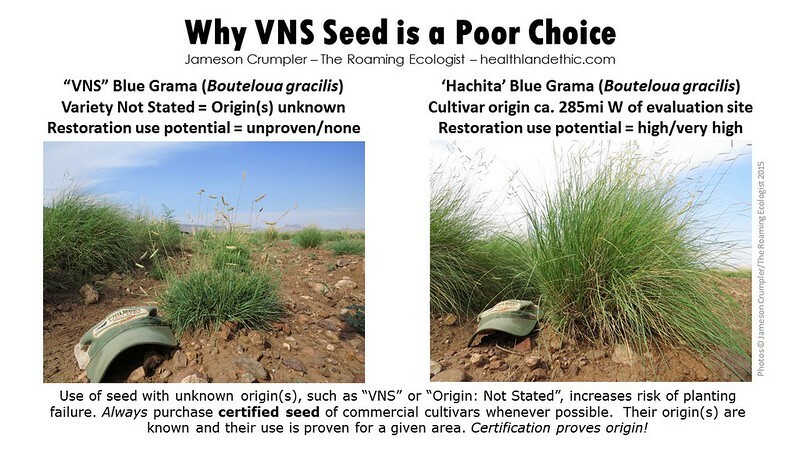 The difference in plant performance is proof of concept of why it is risky to purchase VNS (or even “wild harvest”) seed for use in re-seeding hyperdegraded sites like pipeline right-of-ways. Commercial cultivars and selected native germplasms have been developed since the post-Dust Bowl years for the native seed industry for this very reason. Finally, remember the basic rule of seed mixes: the more species, the better the planting. Don’t settle for a three or 5 species mix! Below is the seeding recommendations list. If it does not load, a copy can be seen here. Tagged certified native seed, native seed, pipeline re-seeding, pipeline seed mixes, right of way seeding, selected native germplasms, South Texas Natives, Texas Native Seeds, trans pecos pipeline, west texas pipeline. Just thought you should know that this pipeline project will NOT be bringing said much needed gas to Presidio, or even Mexican communities- as it’s meant to be shipped to Asian markets via Mexican ports. Please don’t believe what ETP has released in regards to this, as the landowners and communities involved are being directly affected negatively by this pipeline. The pipeline is meant to serve the 1% that have invested in it, such as Kelsey Warren, and Carlos Slim, this serves no public good and will have damaging and lasting effects in this region of the state. Quite frankly the pro-fossil fuel message in this post seems almost paid-for. You can’t justify the damaging of land and culturally significant sites for something that won’t even benefit anybody except those directly involved and in charge. Please do further research on the TPP. First of all, I appreciate all your information on grasses. But I digress on you considering this the landowners responsibility to replant. It IS Energy Transfer Partners responsibility to replant the areas they destroyed by putting in a pipeline, not the landowners. I also digress to your attitude that this is a done deal. We are fighting this tooth and nail & will continue as long as needed. I also digress that Presidio needs this gas to replace their current heating needs. It would costs upwards of 20 million dollars just for the gas to be delivered to the city limits of Presidio and then the infrastructure would have to be put in place to the houses and then the individuals/businesses would have to spend their $$$$ to have it brought into their homes & no telling how much to convert their stoves & heating units. So for you to state this gas is destined for Presidio is pure bunk put out by the ETP to justify calling this pipeline a common carrier. I will not go into the many other misconceptions (lies) that ETP has propagated concerning this pipeline, but I have spent the last 10 years at my house trying to bring the damage wrought by overgrazing by horses on my 4 acres and have not been totally successful by my dependence on just the rain/prudent mowing, etc. So there are many factors involved other than just planting “the correct” mixture. I would prefer none my friends were subjected to having to even think about the PERMANENT DAMAGE that will happen if this pipeline has to go in. Check your facts people! Presidio is not getting the gas. It is going straight to Mexico. If they want they it. they would have to pay $1,000’s to get it and that is if Presidio even pays to have it brought into town. It is coming into the area many miles west and then tunneling under the Rio Grande. It will, in the end supply Japan. This pipe line is gong to destroy a region called the Big Bend. You should actually come out here and see what will be destroyed. Most likely you are in the pocket of big oil. As for replanting, so you can not tell? You say this has to be civil, so I can not comment on that. This pipline is already changing the town we live in. Do not forget about the lights that they will put in. We are dark skies down here for the McDonald Observatory. Not anymore if this happens. Why can these pipeline workers trespass on our land and not get arrested but if one person steps on there land to check permits they are IMMEDIATLY aresseted? Our biggest hazard out here is fires. Guess what they started 2 days ago? A fire. That info was squashed. The other 2 were reported. You are big oil, NOT a nature group. A wolf in sheep clothing. Well Mr. Crumpler, this a fine way to celebrate a holiday. Eggs, decorated or not, are better hidden in grasses and woody brush when those flora are native in the way you describe. I guess you are saying that the consumer/restoration agent needs be aware that some commercial products are not as clean or pure as I would like to believe. Would you apply the old 99 and 44/100 % pure rule? That might be high but it beats the 7% solution. 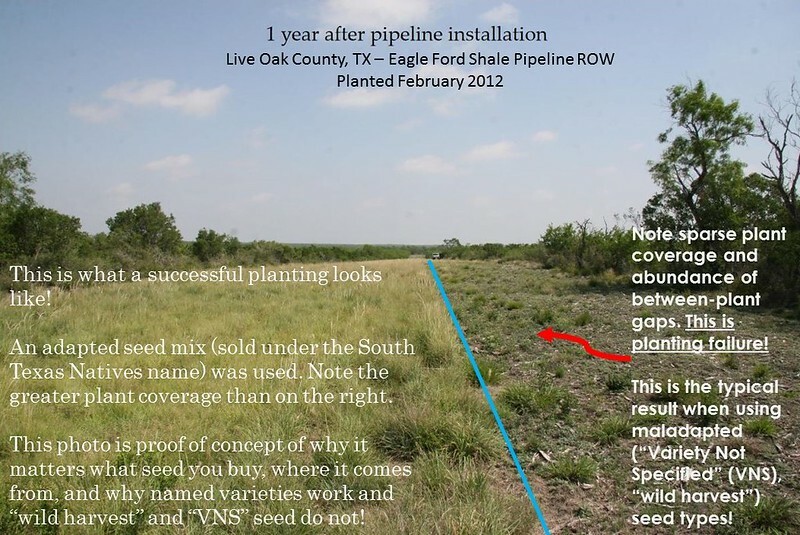 Why is the gas company not doing appropriate ecological restoration and stewardship as part of the ROW work? In short, restoration isn’t an energy company’s first job. In the end, restoration/reclamation work is up to the landowner, who can dictate, to a degree, what seed sources to use, how to plant the seed, where to avoid trenching and other energy exploration-related work, etc., so long as such language is written into the surface use agreements they put together with the energy company. There are currently no Texas laws that mandate an energy operator to restore or reclaim their work areas. This varies from state to state – for example, Oklahoma does have a surface damages act with respect to energy exploration. Thanks for your reply. I had not realized this was the case. Seems like a change is long overdue.